A few summers back, interior designer Bridget McMullin found herself without access to a family beach house at the Jersey Shore for the first time in her life. "I was so bored on the weekends; I was sitting around twiddling my thumbs," she says. Renting a house in the area for the season would have run her about $2,000 to $2,500 per week, so she got creative. Always intrigued by a seasonal trailer campground that sat right between the bay and the coast in Strathmere, New Jersey, she decided to stake her claim. 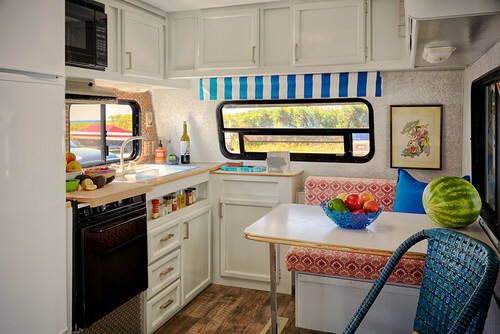 She hitched her design skills to a used 1998 28-foot Wilderness trailer, spending $5,000 to buy it and keeping to a budget of under $5,000 to renovate it. While she has to rent her spot, she doesn't have expenses like property taxes or pricey flood insurance. "When I told my parents about my idea, they looked at me like I had 10 heads," McMullin says. 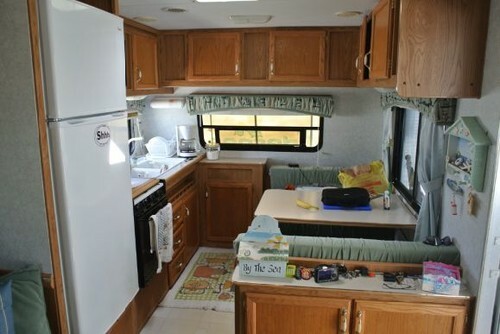 However, she convinced her cousin to get a trailer and join her that first summer, and they plan to hold court in the campground for years to come. 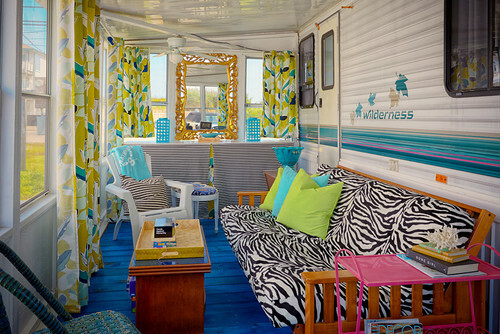 For the first few months, McMullin spent most of her beach days toiling away, renovating her trailer. A water-hookup mishap caused a flood on the first day, so removing the soaked carpet was the first task. Next on the list was painting all of the oak to lighten things up. 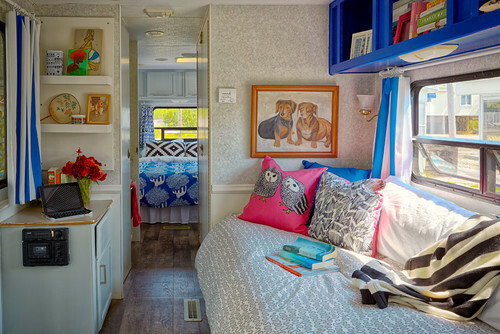 AFTER: "I just wanted it to feel kitschy, bright and over-the-top," she says. The result is a lively small space that serves as a true getaway. Including the porch, the square footage is about 400 square feet. "It's spacious by Manhattan apartment standards," McMullin notes. She removed the cabinet doors over the bed and painted what remained an electric cobalt blue, punching up the room even more with the hottest pink she could find. She didn't like the sofa, but she solved that problem by simple keeping it folded out as a bed at all times, covered in an Ikea duvet. When she and her friends and family gather here after a night out, everyone loves to hang out on it. McMullin's dachshund, Watson, inspired her to buy the so-bad-it's-good thrift store painting for $21. "I actually saw it and didn't buy it because I was so stuck on the idea of keeping to a budget, but then I realized my mistake and had to drive an hour to go back and get it," she says. A glimpse of the bedroom shows another clever touch. She loved the blue Ikea fabric you see on the duvet cover but it had been discontinued; all she could find were a few drapery panels. Her mother sewed them into a duvet cover for her. McMullin ripped out the soggy carpets and replaced them with vinyl flooring that looks like hardwood. 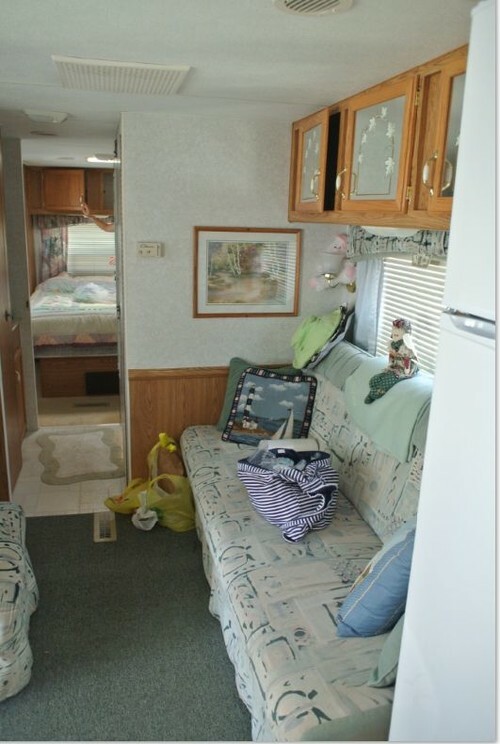 Every inch of storage counts; baskets underneath the bed hold kitchen overflow and other items. The old kitchen was dark and cramped. AFTER: "Painting all of the oak light gray made the most dramatic difference in here," McMullin says. She used a self-leveling paint that dried in an hour and required only two coats, without primer. To open up the space, McMullin removed one of the banquettes. She covered the remaining one in a needlepoint cover she'd been holding on to for 10 years, knowing she'd find the perfect use for it someday. The backsplash is penny cork tile covered in polyurethane. She replaced the existing hardware with polished nickel versions and added a valance, and her work in the kitchen was done. A lack of options in ready-made futon covers drove the design on the porch. "Pretty much everything was hunter green or wine; I knew the zebra would serve as my neutral," McMullen says. The fact that these lively drapery panels were on sale at Ikea made that choice easy for her. Next came the black and white striped skirt under the mirror, sewn by her mother. The skirt conceals a beer refrigerator, her tools and bins for her guests' belongings. The existing porch pad flooring is cracked clay that gets slick when wet, and was causing constant sandiness inside the house. "I needed something that I could just sweep the sand off [of]," she says. 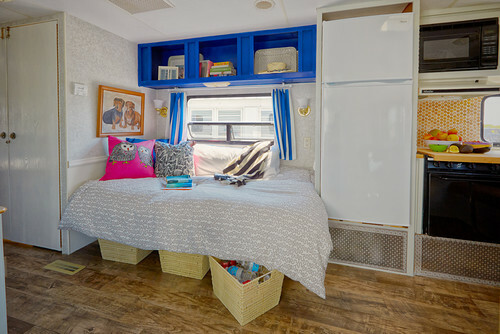 She bought $200 worth of lumber, painted it in the trailer's new signature cobalt blue and bolted it over the existing tiles. Each season she has a gentleman take down the porch for her, and she disassembles the floor in about an hour. "A lot of my clients want their vacation homes to look completely different from their full-time homes, and that's how I felt too," McMullin says. The hands-on experience taught her to take risks. It also enticed those family members who originally looked at her like she had 10 heads: Now her cousin, her parents and other friends all join her in their own trailers just a few yards from the beach.